Don't you love when stories have happy endings? 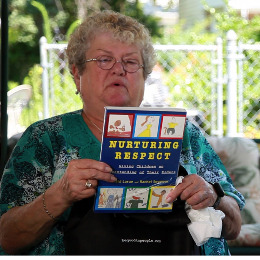 Karen Klein, the bullied bus monitor from Greece, New York has launched an anti-bullying foundation. The video of a group of middle school boys tormenting Klein on the bus sparked an international outrage and received more than eight million total views. Karen joined forces with giveback.org and posted a message with hopes to get people involved and donate to the cause.
" Hi, my name is Karen Klein. As many of you know, I am the woman who was bullied on the school bus in upstate NY. That experience was one of the worst acts of human behavior that I have ever had to endure. But just weeks after I was bullied and the YouTube video went viral, a man I never even met decided to do one simple act of love. Max Sidorov, out of the goodness of his heart, decided to raise money through a social media campaign that would enable me to take a vacation. My story inspired more than 32,000 people to engage in their own act of love by donating to a fundraising campaign created by Max for my support. As you probably know, together we raised a lot more money than what I needed to go on vacation. 32,000 people around the world raised $703,873 for my behalf. It has changed my life forever. Now, I am not only going on vacation, but I am able to retire and take care of my family. You have all inspired me by your acts of love. But now it is time for me to give back and to turn your single act of kindness into my own personal movement to stop bullying in America. The Karen Klein Anti-Bullying Foundation, which I am seeding with $100,000, will be the gathering point for millions of people to support the anti-bullying movement. Together, we will change the world." The Karen Klein Anti-Bullying Foundation @GiveBack.org is launching a music tour to combat anti-bullying. They are calling it the No Bully Tour 2012 awareness campaign. If they were able to raise $700,000 for one person, I am sure they will be able to raise thousands more for kids who are bullied every day. The Karen Klein Anti-Bullying Foundation will focus on four main initiatives. According to CNN, Amanda also said that Miss Teen USA Logan West and Miss Universe Leila Lopes will both be involved in the foundation’s efforts. Karen Klein Anti-Bullying Foundation Promo from PaintBox Labs on Vimeo.